In Racing Across the Lines: Changing Race Relations Through Friendship, Deborah Plummer pushes into the next frontier in race relationships. Because racism is so systematically ingrained in our society, we need to continue to attack it with social programs, laws, all kinds of incentives. Yet Plummer points out that even in those corporations, churches, and organizations that may be integrated on the surface, few people in those places relate closely to one another once the workday or worship time ends. Few cross racial and cultural lines to actually become friends. It’s stunning to realize how lacking this basic, human need of friendship is vis-à-vis race relations. Plummer wants to help us close the gap between mere acquaintance and deeper relationship. The chapters convey how very difficult it is to close that gap, cross that line. We naturally “stick to our own kind,” and friendship circles hardly ever overlap. When they do, all kinds of personal, social, and historical habits and misperceptions make genuine, honest conversation difficult at best. “It’s naïve to think that we have overcome racism,” says Plummer, “although we have entered into discussions…Yet , in the new millennium, discussions about race, especially between blacks and whites, play out like a movie script.” Following that script, we don’t really discuss at all, but fall into old patterns either of outright prejudice or polite avoidance. At the end of each chapter Plummer gives us three categories of “exercises”: ones “For Personal Reflection,” “For Group Dialogue,” and “For Spiritual Practice.” “Consciously and willingly, call forth the presence of God while in a multiracial setting. Doing so is guaranteed to reduce racial stress.” That’s the exercise that ends the chapter where she talks about those old scripts. The exercises seem jarring. They lend a kind of schizoid air to the book. From hearing how difficult it is to form cross-racial friendships, we’re suddenly in a multiracial setting calling forth God’s presence. Once I got used to this leap, however, I began to understand what is perhaps the book’s underlying message. Becoming friends across racial lines isn’t just going to happen. There has to be a leap of faith and action. We have to learn how to be intentional. Otherwise, those old scripts will keep us right where we are: segregated—our lives missing the incomparable richness of multicultural friendships, which can widen our world view and deepen our humanity like few things ever do. Know and learn your history. Separate facts from myths…read it for yourself, or sit in class and learn it for yourself. Stay in the present. If there are lessons to be applied from history, they will be more apparent if you are focused in present reality. Do not pass ignorance on to your children. When you make generalizations to your children about white people or other racial groups…they are most likely listening…. Do not let the past determine the future for race relations…. Expect whites to have basic respect for human differences. You will more often find that it is true. Do not put out negative energy about race…. Take the race card out of your deck. Do not play cards with people who aren’t willing to play fair in the first place. Listen for understanding, not rebuttal. Own your sense of identity as an American—vote. Go around for one day thinking about yourself as a white person. Understand that just the fact that you need to heighten your awareness about whiteness is significant. Do not get defensive in conversations about race…. Release the need to be right…. Stop whining yourself. You may not personally experience privilege…but simply by being white, you have historically been afforded opportunities and treated more fairly than other racial groups. Embrace whiteness fully…Being white is not synonymous with being an oppressor. Learn about your culture…. Equal treatment does not mean identical treatment. Being in the majority does not mean ownership. Do not rely on your good intentions to lessen a negative impact. Acknowledge that someone could have experienced something negatively, based on experience and history, regardless of your intention…. These are important lists, and everything on each list is difficult—especially, for whites, acknowledging privilege. That, in my estimation, is the most difficult thing to do on either list, but it would change race relations over night, whether between just two people, or between large groups. Yet every call for an “apology” to blacks for our country’s slave past, or any acknowledgement of white privilege is met with massive resistance. Americans would rather talk about anything—absolutely anything—but race, and especially race and privilege, except perhaps to turn the tables. Many whites love to talk about reverse discrimination—which I believe does exist, but which is dwarfed by absolutely monumental tides of privilege flowing the other way. For every one case of a minority getting into college because of race, for example, tens of thousands never get a fair chance. Plummer’s book doesn’t give us a rosy picture of race relationships today, but it does hold out hope that we can someday not just tolerate each other, but become true friends. Friendship could simplify things by turning down the heat, transforming our over-burdened history and cultural shame into one-on-one, face-to-face conversations. In this way, courageous, intentional friendship could play an important part in helping us to end such massive resistance to talk about what seems so unspeakable. It would be a first step, and still hard, but worth a try. ♦ Go to the Teaching Diversity main page, and to the Reviews main page. ♦ Read about “The Invisible Knapsack,” perhaps the most famous essay on while privilege. 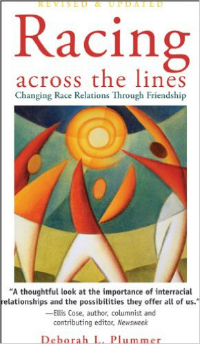 This entry was posted in Diversity & Multiculturalism, Reviews & Commentary, Social Change and tagged Deborah Plummer, Racing Across the Lines: Changing Race Relations through Friendship. Bookmark the permalink. The best way to circumvent racial issues is to lead by example. Undergraduates will learn better if we, the older generation (like how we viewed “our” parents when we were that age), exhibit global behavior. Unless a global approach is demonstrated by us, the parents of this current generation, progress will be slowed down. Not that it is anywhere where it ultimately should be, but we must carry on with what has been already tried. Example is the key to circumventing stereotypical thinking. Thanks for this review…The third edition is coming out soon…I understand the jarring nature of the journalogue…as the book was published by Pilgrim Press in hopes of use primarily with their congregations. I am working on another book that covers the topic from a wider lens and written for a general audience outside of faith communities. Thanks again, for taking the time to read it . Your feedback is valued and appreciated.